Château de Azay-le-Rideau was built from 1515 to 1527, one of the earliest French Renaissance châteaux. Built on an island in the Indre River at Azay-le-Rideau, its foundations rise straight out of the water. Gilles Berthelot, Treasurer-General of the Finances of France under King Francis I and mayor of Tours, began reconstructing Azay-le-Rideau's earlier medieval castle, that was part of his wife's inheritance. However, it was his wife, Philippe Lesbahy, who directed the course of the works, including its central internal staircase (escalier d'honneur) that is Azay's greatest most remarkable feature, inspired by the staircase at Châteaudun. When Berthelot was suspected of collusion in embezzlement he was forced to flee from incomplete Azay-le-Rideau in 1528; he never saw the château again. Instead, the king confiscated the property and gave it as a reward to one of his high-ranking soldiers. Over the centuries, it changed hands several times until the early part of the twentieth century, when it was purchased by the French government and restored. The interior was completely refurbished with a collection of Renaissance pieces. 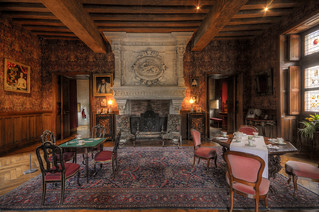 Today, the château is open to public visits, and is operated by the Centre des monuments nationaux.